The theme for the 81th Lustrum of the University of Groningen is All Inclusive. The Eric Bleumink Fund (EBF) is a perfect match with this theme. The EBF offers talented students from developing countries the chance to study in Groningen. This way they can make a contribution to development in their own country. 71 young, ambitious and talented students have received a EBF fund since the year 2000. The total costs for one grant are approximately € 27,500. Through this special lustrum crowdfunding campaign, we want to raise extra funds for the EBF. Five new EBF students will start their studies in September 2019 and it would be great if six EBF students could start in september 2020! You can help us raise these funds by donating or by helping to raise funds. All donations are welcome! The EBF is a named fund of the foundation Ubbo Emmius Fund. 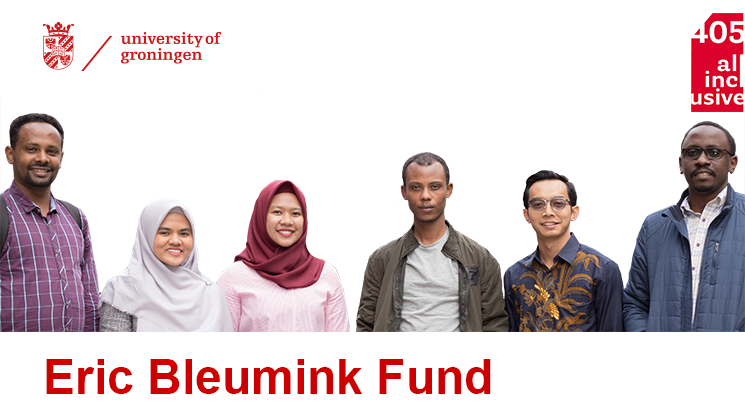 The Ubbo Emmius Fund supports science, education and research at the University and is a public benefit organization by Dutch law. Donations to the Ubbo Emmius Fund for the EBF are tax deductible to a certain extent. Since all costs of the Ubbo Emmius Fund have born by the University, your donation is fully benefiting the EBF and ultimately the grant holders. The UG was founded in 1614, and therefore we are celebrating! Many thanks for your festive contribution! UG 405 years, a reason for a party. Many thanks for your donation! It is the 81st lustrum, thus, time for a big celebration! You truly understand it: this way we will very quickly reach a full EBF student grant!